You Save: $27.96 (85%) Ships in 1 day. Publisher: Peter Owen Publishers, London, 2008. Soft Cover, 262 pages, 5.5 x 8.50. A direct descendant of Arthur Guinness himself, author Patrick Guinness gives us an indepth portrait of the man who built one of the most famous breweries in the world. Ireland's best-known Irishman (his name and signature in every household and village in Ireland) is also the least known. The Guinness family and brewery -- both a part of Dublin life for over two centuries -- have passed into legend, but their origins have been obscured. Here, for the first time, the story of the man and his background is told. Family and social history are combined with an account of the brewing process and descriptions of economic and political backgrounds in a rapidly developing Ireland, giving a rich weave to this tapestry. Visual sources include maps, rare original documents, prints, and photographs of associated houses and places, people and artifacts. The result is a fascinating contextual portrait of an enigmatic figure, the founding father of one of Ireland's most powerful dynasties. The life of Arthur Guinness, as recounted here by one of his direct descendants, is compelling proof of Dickens's dictum. Rising from obscure beginnings, Arthur laid the foundations for a world-famous brewing empire in Ireland's capital, but his story has never been comprehensively told - until now. With a mixture of new research and the insight of a family member, Patrick Guinness has reconstructed the life of one of Ireland's most celebrated yet enigmatic figures, bringing his ancestor, the brewery and the dynasty he founded - and the tumultuous times in which he lived - to life. Arthur is revealed as far more than just a businessman with a nose for a good brew, as he mingled comfortably in a society peopled with such illustrious characters as Wolfe Tone, Richard Sheridan and Samuel Johnson, but was no less at ease with the likes of the Turkish 'doctor' Achmet Borummadel, who turned out to be a Kilkenny conman named Patrick Joyce, or George Fitzgerald, the wastrel duellist who manacled his father to a bear. 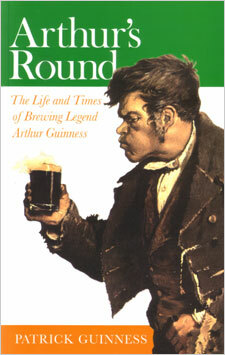 Arthur's Round sifts the fact from the fiction - corrected many generally accepted myths along the way - and offers the readere an insightful portrait of the remarkable man who created Ireland's national drink.